Believe us, it has been a very long school term, but after eleven action packed weeks it’s finally here: the nirvana that is two whole weeks school holiday. It’s a sad but very true fact that, of all the time constraints we are under here on the Homestead, the task of getting Farm Girl to, and uplifting her from, the Kingdom of Nova each weekday is by far and above the most arduous. But that most glorious of times has now arrived: holiday time! No more nagging Farm Girl into observing an acceptable bed time, and hence no hassling her to get out of bed, get dressed, eat breakfast, brush teeth and hair, clean your face, no, CLEAN your face, get your bike, helmet, school bag, let’s go, go! go! go! Hurry! Ahead of us lies the balmy waters of cruisey evening meals, lazy lie ins, and days filled with nothing in particular. Bring it on! Not that we’ve got nothing to fill our days; perish the thought! The animals still need to be attended to, the gardens, too, and the Homestead itself is crying out for a good helping of TLC. Somehow, though, all these things are so much easier to tackle without one eye on the clock. Besides, Farm Girl is one more set of employable hands. Top of the Holiday List is building a new shelter for the goat paddock. 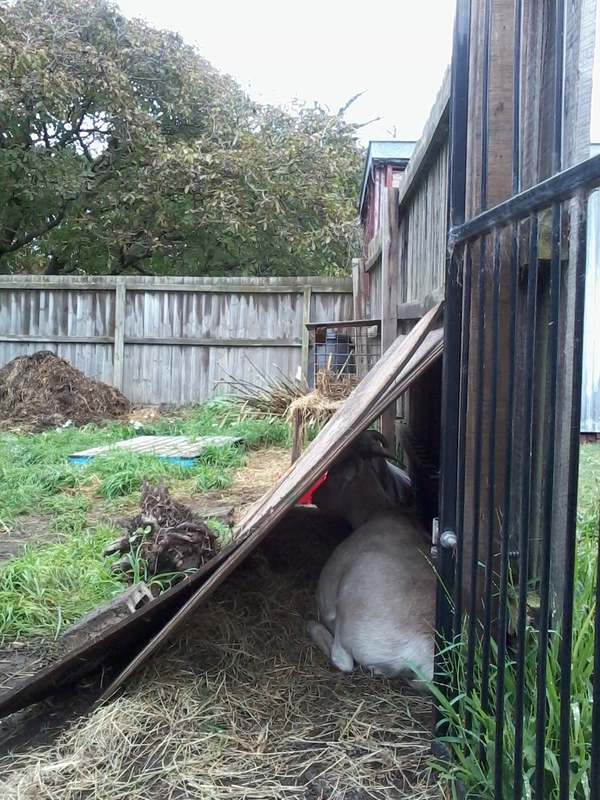 The Chalet is all very well, but the goats much prefer what we refer to as The Train: a sheet of “inherited” plywood wedged up against the paddock fence. The thoroughfare design makes for much goat merrymaking, the situation allows for uninterrupted views of the back door ensuring doleful maa’s and baa’s are well targeted, and in times of extreme inclemency in the weather department, two goats can sit back to back enjoying the combined body heat whilst turning a blind eye to home-ownership compromises. Sadly, however, scavenged hunks of plywood, whilst plentiful in post-quake Christchurch, have a definite lifespan and that utilized for The Train is no exception. It now sags quite alarmingly, causing Geraldine in particular, who is a stately goat, to adopt an unladlylike bow-legged, hunched back stance whilst entering and exiting. Plans are afoot, timber has been sourced, and we have lots of long nails and binder twine (essentials to any Homestead build) to hand. Now we just need it to stop raining. 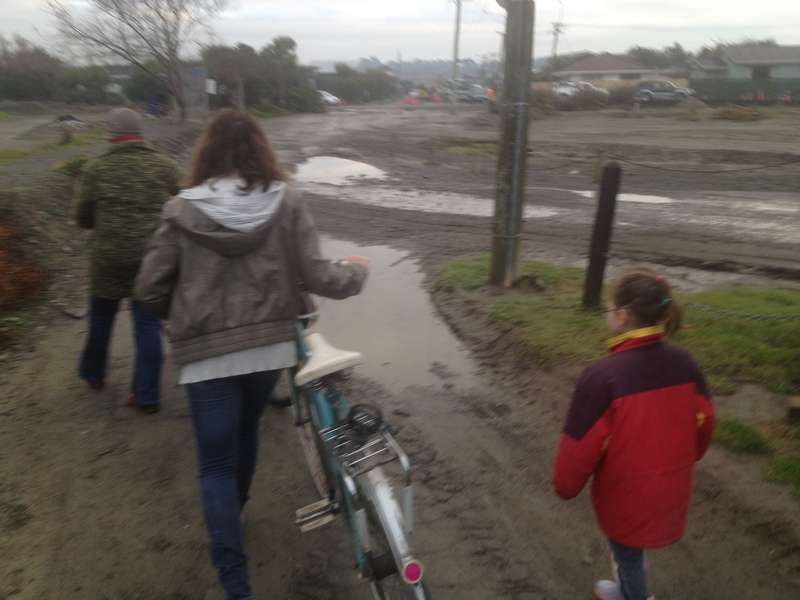 Yes, it’s Easter Weekend and that, for Christchurch at least, customarily means rain. Currently the ducks are the only beings outside that are enjoying themselves, and this enjoyment has had a rather adverse effect on the backyard aesthetics. This and other duck onslaughts will be, we plan, rectified two holidays down the track when the sap begins to rise and the blossom show. For now all we can do is overlook the debris and enjoy the antics. Whilst it is raining, however, we are not standing still. The Farmer has now relocated his sleeping area to the living room leaving his room free for it’s turn in the makeover stakes. Not known for being swift to dispose of property, it has been a long and heart wrenching journey to the five boxes now stacked artfully in the hallway. Over the next two weeks the room will be subjected to The Renovators “non-contact” university time (which is what they call holidays when you’ve got several thousand assignments pending) and hopefully emerge an empty shell with wonderful floorboards exposed and an outside wall crammed full of insulation. Fingers crossed that some of the assignments will also be exited off the list. In the garden, we have a bin full of compost begging to be excavated and liberally distributed around the broad bean and cabbage seedlings, whilst another couple of raised beds wait to be planted out. This time of year is so seat-of-the-pants for us: do we wait another week or so to allow the tomatoes a chance to ripen on the vine or do we rip them all out and get on with the winter planting? It’s mighty nice in front of the fire today, just saying, and some jobs can wait for another day. Harvesting our latest crop has also halted due to the weather. 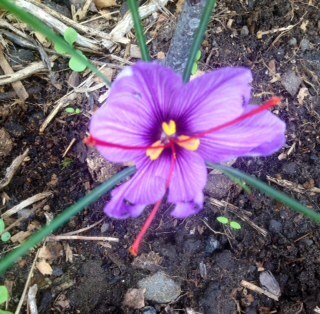 The saffron orchids seem to adore the rubbishy, sandy soil running along the drive and the stash of dried threads is growing steadily. Just whether we’ll keep this decadence for Homestead consumption or put them up for barter is still in the lap of the gods. So the holidays promise to be productive one way or another. Hopefully they will also help to ease Leia’s heartache at the loss of her paddock mate, Nessie, who skipped into the van last Saturday without a care in the world. The trip to the farm as alluded to in last weeks blog Showing Promise, was uneventful: the best possible type. At the farm she may have initially dragged her heels, but once in the goat paddock she was totally up for a little muscle flexing and The Farmer reports her reintroduction to the flock has been seamless. Something we didn’t anticipate, though, was Leia’s sorrow. Nessie had never been that kind to tenderhearted Leia, shoving her around the paddock mercilessly and doing her best to ingest the contents of both the food bowls herself. It was a surprise, therefore, for us to return home and find Leia, not gallivanting around and enjoying the company of a much easier going paddock companion, but standing on the I’ll-just-have-a-wee-sit-down-after-clipping-those-hooves chair, bawling the loss of her bestest friend in the world to the neighbourhood. Geraldine, being an intelligent goat when all’s said and done, let her get on with it as it left her free to snaffle every shred of hay in the entire paddock. 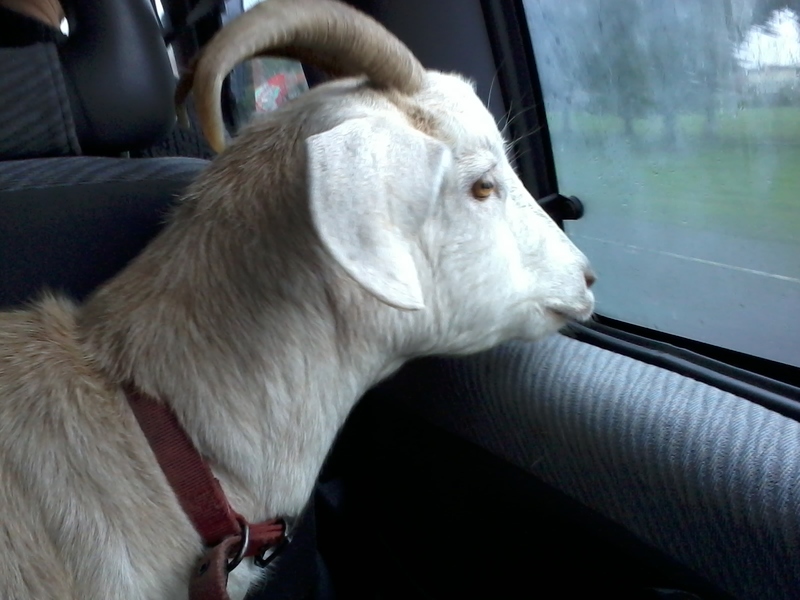 Hopefully the falling temperature will ensure the need for closer goat contact and an uneasy friendship will ensue. We can but hope. As we bash this out, the wind is roaring, the rain falling, the goats and chickens hiding, and the ducks excavating. 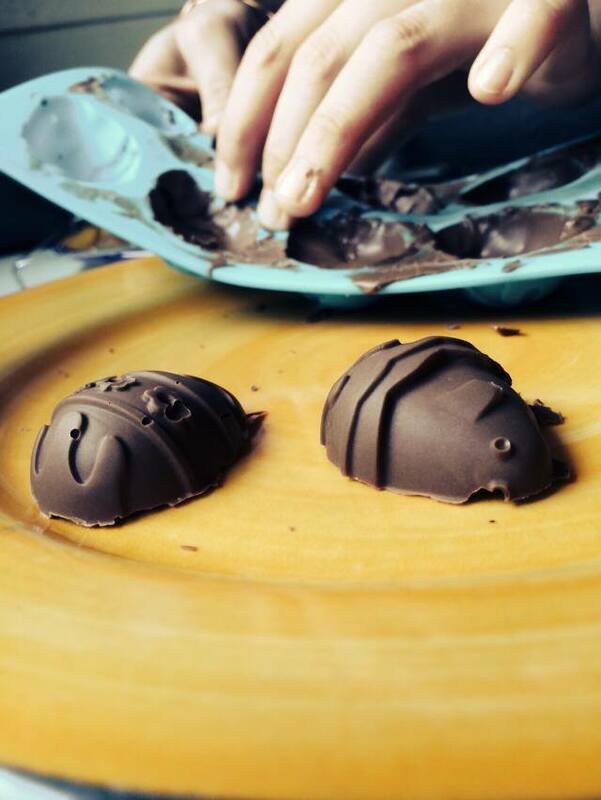 Inside, we have the fire roaring, lunch of hot cross buns and good coffee is a fond memory, and the smell of molten chocolate is thick in the air as Easter eggs are assembled in preparation for Sunday. 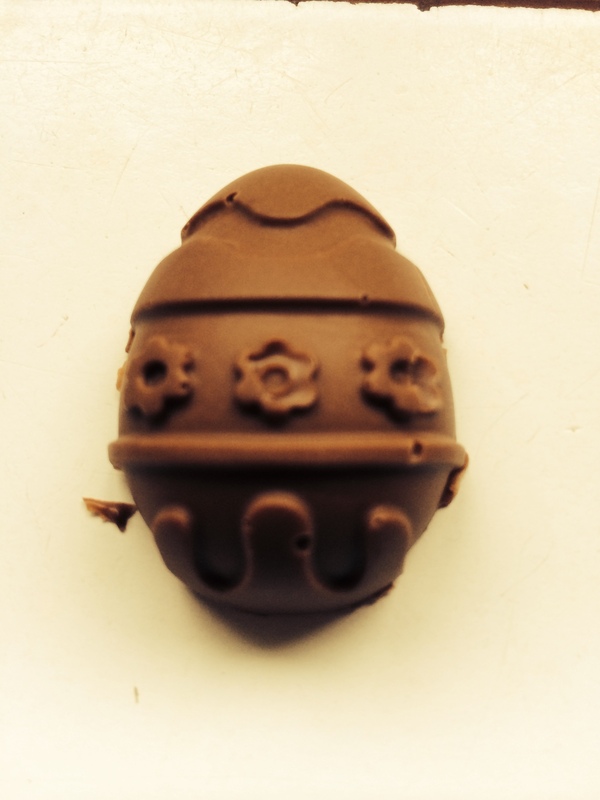 We wish you all a Happy Easter full of whatever you feel fitting and if, like us, you’re at the beginning of a break from your usual routine, we remind you to savour it. Lie in, take it easy, eat another hunk of chocolate; you’ve earned it. 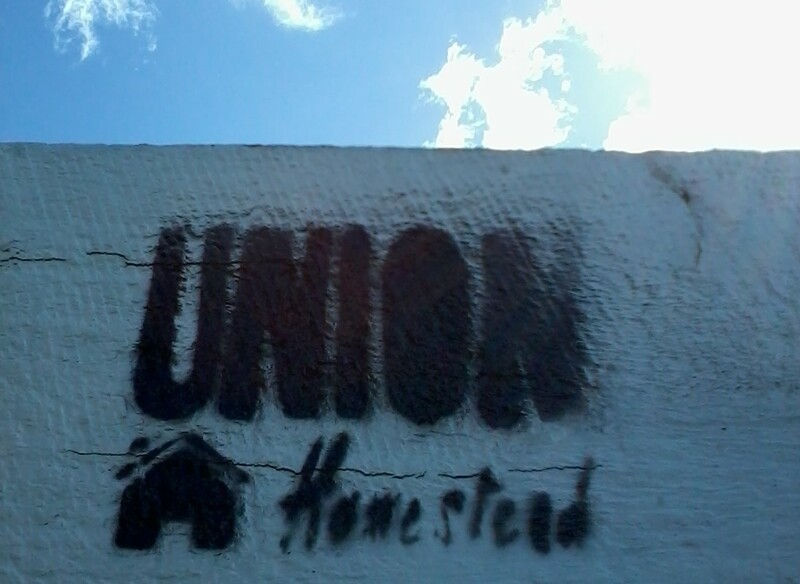 © Copyright Union Homestead 2014. 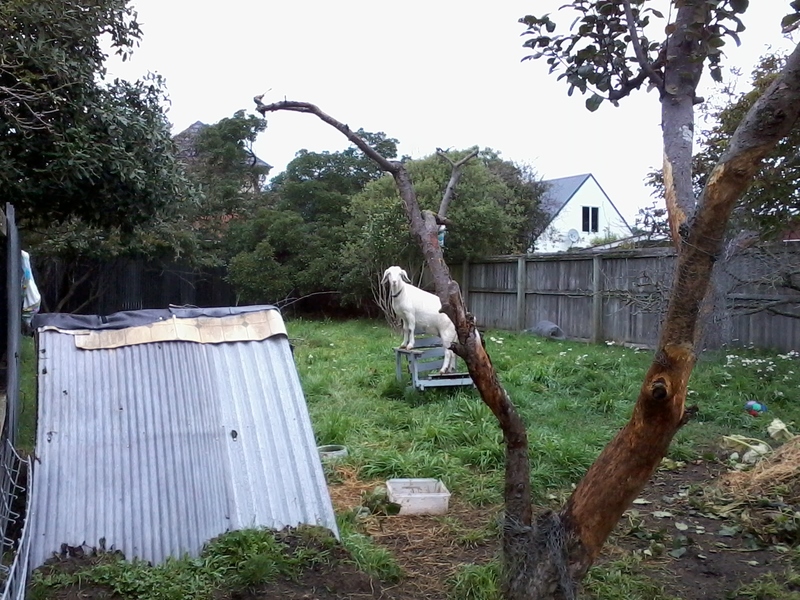 This entry was posted in Goats, Union Homestead and tagged animals, break, building, Chicken, crafts, DIY, duck, Easter, easter eggs, Family, flooding, garden, gardening, Goat, Holiday, packing, rain, relaxation, renovations, rest, saffron, school holidays. Bookmark the permalink.